<br>The beloved and critically acclaimed LEGO Star Wars franchise is back and coming to homes around the world in 2011. 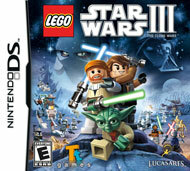 LEGO Star Wars III:The Clone Wars, combines the epic stories and iconic characters from the Star Wars universe and hit animated TV series Star Wars: The Clone Wars with all new gameplay features.Players will enjoy brand new game mechanics allowing them to create, control and explore in a galaxy far, far away like never before. Promising breathtaking visuals as well as new characters and levels, the game also features the signature tongue-in-cheek humor from the LEGO universe. With over 20 story-based missions and 40 bonus levels spanning the entire Clone Wars era, LEGO Star Wars III: The Clone Wars will allow fans to explore endlessly and laugh their way through the Star Wars galaxy in the most humorous, accessible and action-packed LEGO game to date.